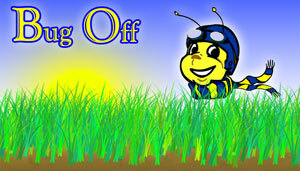 Bug Off was designed in one of our flash classes. The goal of Bug Off is to save Glitter – a damsel in distress butterfly. Glitter has been captured by the Evil Ant Lord and is in desperate need of a rescuer. You take control of Bigglebee, a heroic bumblebee, as you run, jump, and navigate your way through the Ant covered lawn. The hero of our tale, Bigglebee hears of Glitter's capture and takes off in pursuit. He throws on his flying goggles, helmet, and scarf for his up coming adventure. The damsel in distress. Loved by all bees. Glitter falls hostage to the Evil Ant Lord for her ability to produce caterpillars. This is the power the Evil Ant Lord will hold over the bees earn his every evil whim. We were going to include evil flies who have sided with the ants. We ran out of time and thus the flies – who didn't make much a part in our story – were cut out. This is an object I was going to use in place of the mushroom platform. I was voted against however; so this object just gets a place in our concept art section. The Chuckapult which was voted out of the game was going to be the secret weapon of the Evil Ant Lord. Legend has it, the Chuckapult is operated by Chuck Norris himself. It flings rocks which Chuck Norris has christened with his Walker Texas Ranger hat towards all that dare to wander within range.